If you ask any local SEO what the nature of our industry is like, you’ll get a range of answers from ‘exciting‘ & ‘high-growth’ to ‘ever changing’, ‘full of opportunity’ and ‘challenging’. The local online advertising market has seen strong growth over the last few years and this positive trend is expected to continue. Research group BIA/Kelsey forecasts that local online ad revenues will double between 2010 and 2015 to US$45 billion (US market only). While SEO is distinctly different from online advertising, the objective for clients is the same. National and local businesses need to reach local consumers and the Internet has taken over from traditional local media as the primary channel for reaching their critical local markets. So on paper, the future for the local SEO market appears positive. But what is life ‘on the ground’ like for local SEO providers up and down the country and across the world? The 2011 Local SEO Industry Survey sets out to answer this question. The survey (conducted by BrightLocal.com) polled over 1,150 local SEOs* on a range of topics covering annual turnover, services and prices, growth predictions and which SEO tasks they enjoy or dislike the most. The survey is ongoing, but the initial responses have been processed and the following charts and analysis are the output. These charts represent the key findings of the survey. Full survey findings can be viewed on theBrightLocal research portal. Read on for some key insights for local SEOs based on the data collected thus far. Client turnover volumes vary significantly between the different types of SEOs. 31% of SEOs turned-over less than $30,000 last year with this figure rising to 51% among Freelance SEOs. Unsurprisingly, it was National Agencies which claimed the highest turnover with 33% earning in excess of $500,000. However, just 4% of Local Agencies were in this earnings bracket. The survey found that business is booming for SEOs with the quantity of clients being handled per SEO increasing across the board year on year. One of the most interesting and controversial findings from the research is the number of SEOs who are new to the SEO industry. Key Insight: While it’s exciting that the local SEO industry is growing rapidly and attracting new talent, the influx of new SEO providers is a cause for some concern. The SEO industry already suffers from a negative reputation caused by poor service being dished out by too many inexperienced and underqualified SEO providers. The entry barriers to joining the local SEO industry are virtually nil – a cheap website, an online Google Places training seminar and a friend’s business to practice on. At least that is the pitch that many wannabe SEOs are sold on. This quick-fix career opportunity often results in below-par performance for clients which tarnishes the reputation of the local SEO industry as a whole. It appears that new business is not hard to come by for local SEOs. 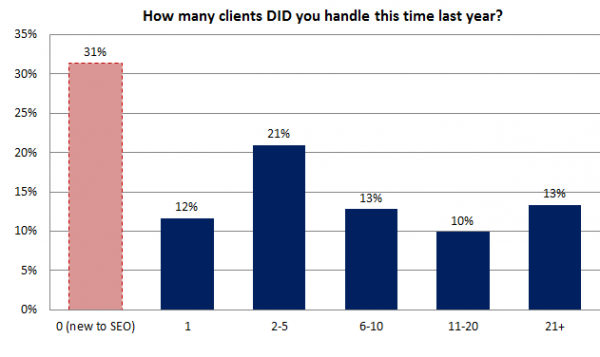 46% of local SEOs claim that they do not actively seek new clients. For those SEOs who do actively engage in lead generation (inbound or outbound) the results are very promising. More than 50% of all SEOs claim to have a 70-100% success rate in converting leads to customers. 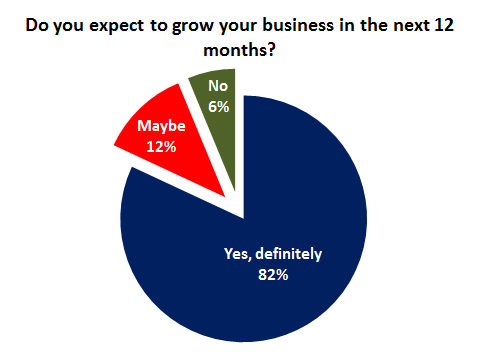 Confidence is not short among local SEOs with the majority believing that the next 12 months will result in greater revenue and them taking on more employees. Key Insight: A major contributing factor to this growth is the appreciation among local business owners of the value of good online visibility. Local businesses can no longer ignore the Internet and many are investing in the opportunity because they hear about or see their competitors doing it. It’s no longer first-mover opportunism that drives the market but the fear of being left behind. 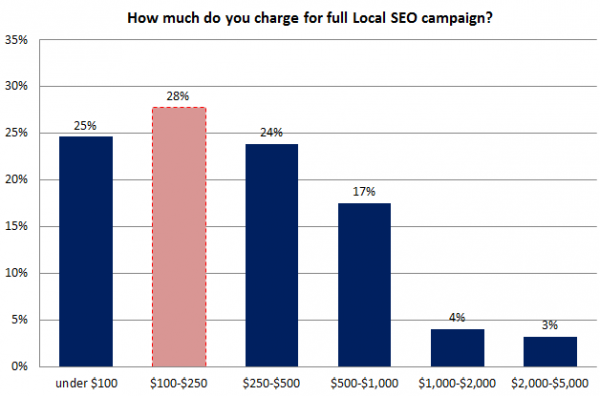 This is evident in the following chart which shows that 64% of local SEOs claim that it is easier/much easier to convince potential clients of the benefits of SEO. When it comes to pricing their services, the survey found that the mean price* (i.e. the price which most SEOs charge) for a full Local SEO campaign is $500-$1,000, while the mean price for just Google Places optimization is between $100-$250. This pricing level is a concern for the long term prospects of many local SEO providers as it restricts earning and investment potential. With turnover levels as low as they are can SEOs afford to invest in themselves (i.e. training) and new technologies? SEOs need to find new services which increase the value of their offering and develop more efficient working practices which allow them to make more profit per client. Without these advances, the life for a typical local SEO will remain a struggle. The survey also explores attitudes towards Social Media and its effectiveness for local businesses. It also asks SEOs to list the typical daily SEO activities they tackle and which they like/dislike the most. All survey responses are charted and displayed at the end of the survey so you can quickly compare your situation to others like you. Click here to take part in the survey . Guest Post – Will It still Work after Google HummingBird? December 18, 2013 Dilip Rajpurohit Comments Off on Guest Post – Will It still Work after Google HummingBird?